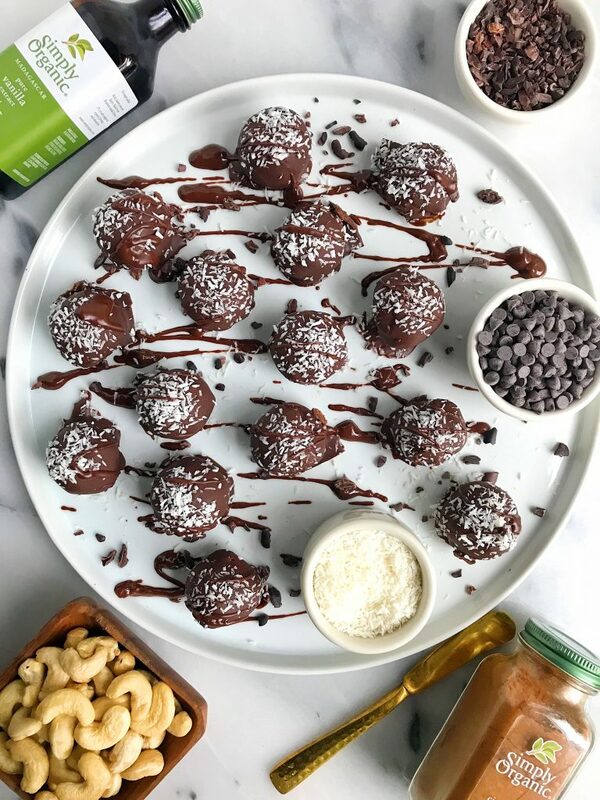 Paleo Coconut Brownie Batter Truffles made with simple ingredients for an easy chocolatey dessert! IT’S THE HOLIDAY SEASON FRIENDS! YAASSS. I cannot believe that is already November. My Mom is talking about the first Thanksgiving at their house and our family Hanukkah party coming up. And despite the fact that I am usually freezing my tush off on the east coast this time of year, it truly is a magical season NYC. The lights are hung up on the streets, the tree will be up soon and there is this extra ‘something’ in the air. I would be lying to you if I said that the holiday season was hearts, stars and rainbows all the time. And while it truly is a special time of year, many of us can feel stressed, overwhelmed, alone or just straight up BLAH. I’m not going to go all grinch on you guys because I love the holidays way too much to even think like that, but I do want to talk about something I personally used to struggle with this time of year. I know, crazy. The food blogger used to stress out over food around the holidays. And I’m not talking the stress of having to make too much food or prepare food for anyone. Because to be honest, I let my mom, mother-in-law and my grandparents handle all of that, ha! I am talking about the stress of being surrounded by so much food and eating activities around the holidays. There are always so many dinners and get togethers filled with all your favorite cookies or cocktails, etc. and it can be really overwhelming for some. I personally used to feel very overwhelmed around this time of year (more on that here). Thinking I would gain ten pounds from eating too much of my Mom’s mandel bread (jewish biscotti) or having one too many martini’s. I would think that those traditional holiday items I love, didn’t fit into my “real food” mentality. Then there is also the pushing of the food on others. I can hear the voices of people trying to shove different foods that I truly have zero desire to eat, in my face trying to make me eat them. I’m not a fan of eggnog, ok? Please don’t make me drink it! Of course no one means harm in doing so but it gives you that awkward feeling when you have to keep declining something. Instead of sitting there being awkward like I used to, I have found a way to stay balanced and keep my sanity around this time of year. It is silly to think that food and the holidays would stress me out. It is meant to be such a happy and joyful time of year, but I was too busy worrying about what would be served over Thanksgiving when I wasn’t eating meat. Do I just pretend to eat everything else? How do I make this not so awkward? This will only be the first Thanksgiving in the past 6 years that I will be joining in on the turkey fun. And I am AMPED. My mom got the turkey from a local organic farm too, which is going to be epic. Remember when I was ‘vegetarian’? I was the first person in my family to ever omit meat so needless to say, that first Thanksgiving was pretty awkward. But instead of isolating myself in the corner, I brought a few dishes with me to the meal. And no, I don’t mean I made single serving portions to bring just for me to eat. I made a couple of dishes and brought them with me for everyone to have. That way I was able to eat and enjoy the holiday and also include everyone else. It is pretty simple if you think about it and I now do this little “trick” often. It is okay that we like to eat the way we like to eat. We shouldn’t feel any shame in wanting the food that makes us happy. But at the same time, it is important to have that balance and enjoy the gluten-filled cookies you love or have that cocktail that is filled with sugar. Balance is everything and becoming obsessed with eating healthy.. well, that is a whole other blog post friends! I am so excited to share that I am partnering with Simply Organic this holiday season to bring you guys a couple of delicious dessert recipes that you can enjoy for their “Cook for a Change” campaign. During the campaign, Simply Organic is reminding us how cooking can inspire personal change and social good. When someone uses the hashtag, #cookforachange, Simply Organic will donate one meal to the Ceres Healing Meals Program. We are hoping to get to over 1,000 meals so let’s get to it. You can also win a $1,300 gift set for yourself AND one to gift to someone special (this ends December 20, 2017). All the details are here. 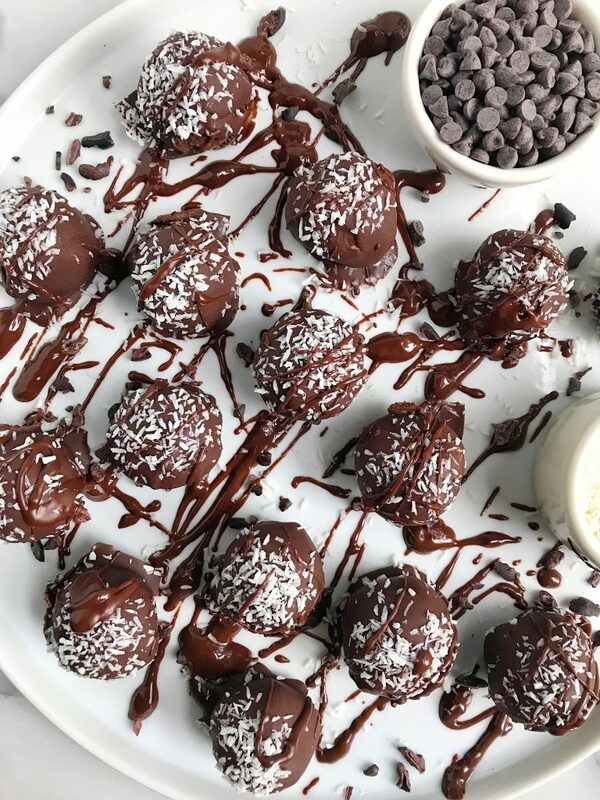 First up we have these Coconut Brownie Batter Truffles! They are vegan, paleo and made with just a few simple ingredients. These truffles are such an easy dessert to bring to a holiday party or make for friends as a gift. 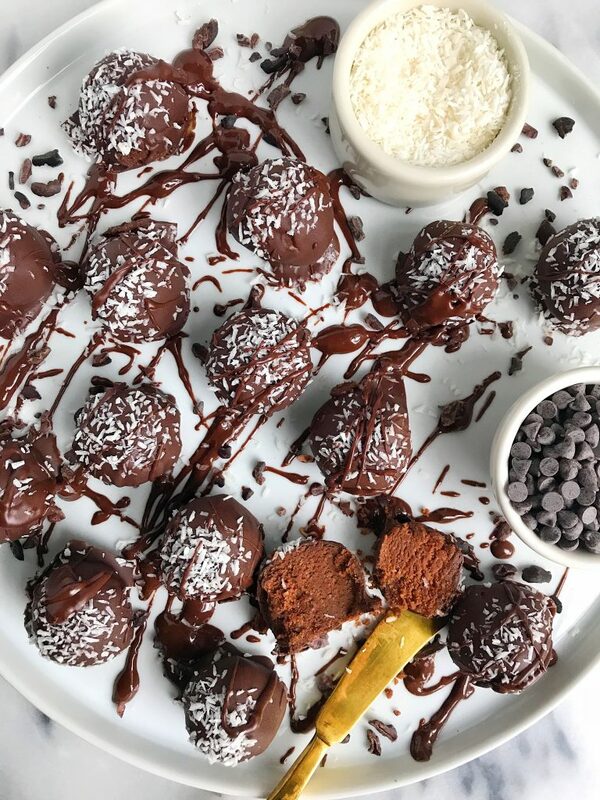 Even if you don’t have much experience in the kitchen, you can absolutely make these truffles (along with really anything on the blog!). I used my two favorite products from Simply Organic in this recipe as well. Their vanilla extract and cinnamon. Honestly you would think I bathe in these products, I go through them so quickly! Their spices and extracts are so perfect for baking and desserts. I add them to pretty much everything as you see on the blog. 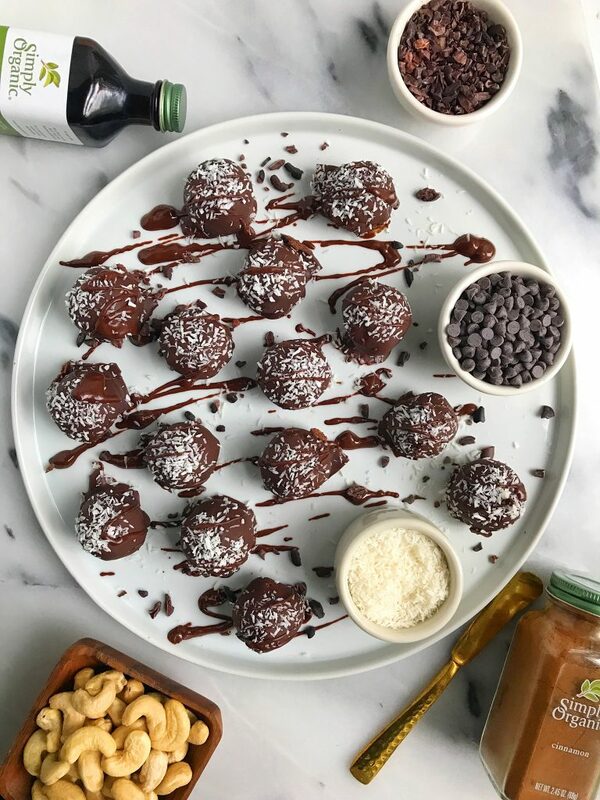 They add the perfect touch to these Coconut Brownie Batter Truffles. I hope you give them a try and bring them to a friend’s home or anywhere. Please enjoy the holiday season and don’t let the craziness of too much food or eating “clean” get in the way! Find a way to bring the best of everything together.